On Monday I shared the Red Mango parfait I had over the weekend. I don’t think I have had a Red Mango parfait in quite some time! Aside from that parfait, all of my meals have been veggie loaded and on the savory side, not counting breakfast. I’m still eating oatmeal every single day — breakfast will always be sweet for me! I don’t do savory breakfast. Never have and probably never will. I enjoyed this villager salad at Greek Cove over the weekend. 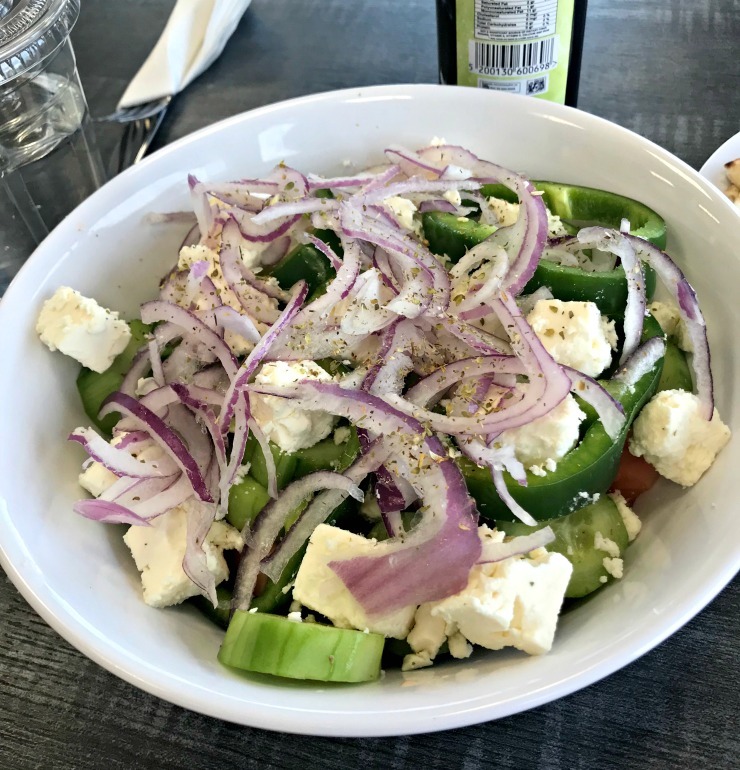 It’s basically a greek salad with tomato, cucumber, peppers, and onions. Simple yet good. Oh! Pita bread on the side. It had been a while since I last went to P.F. Chang’s. I do like the Buddha Bowl. 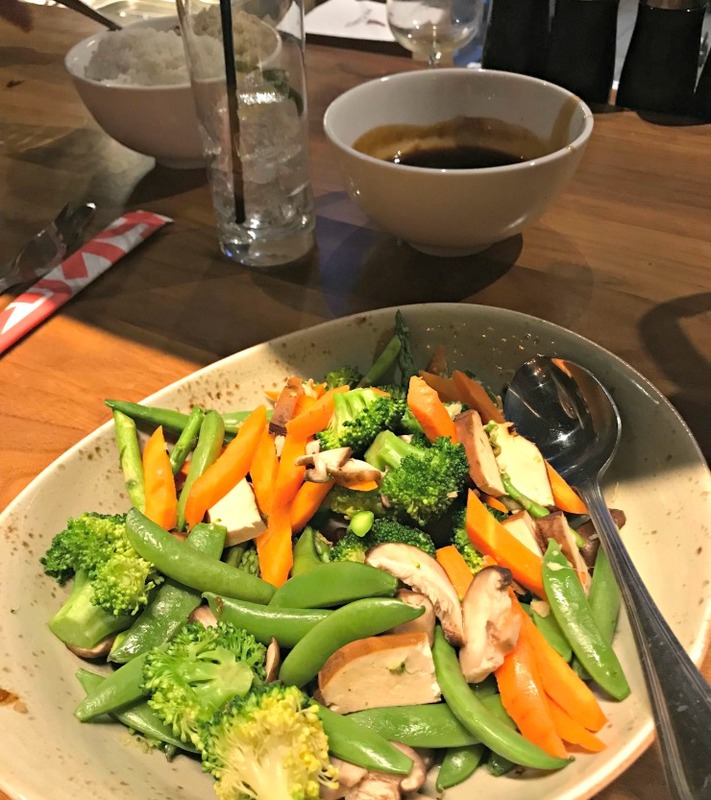 What could be bad about a bowl of steamed vegetables, sauce to dip them in plus a side of brown rice. We used to get a specific sushi roll at P.F. Chang’s but they no longer seem to have it! I can’t even remember what the roll was but we knew enough to notice it was no longer on the menu. Okay, so this meal has been my happy place as of late. 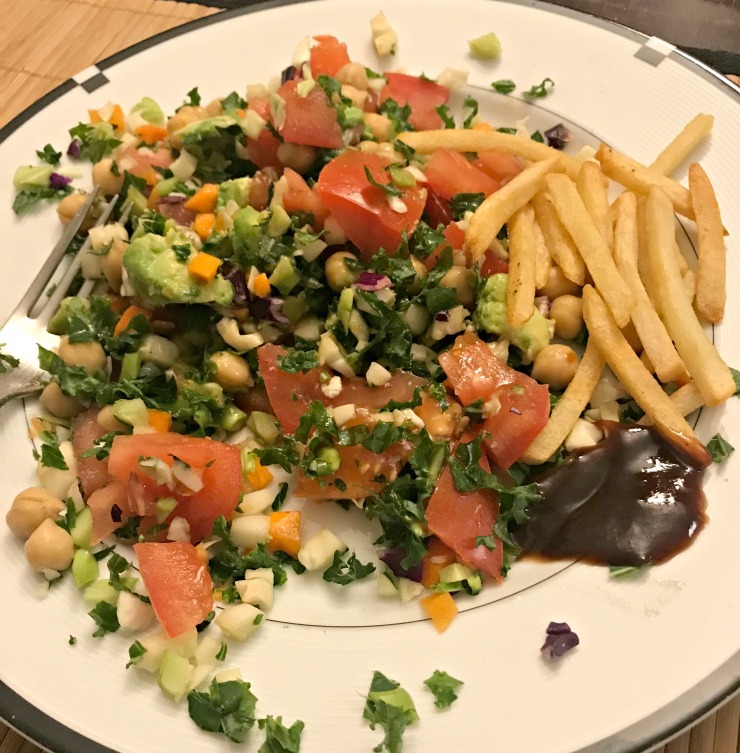 We know I hate to cook right now (and ugh, I despise taking the time to go food shopping too) but I bought the chopped power blend veggie mix from Stew Leonard’s and combined it with chickpeas, avocado, and beefsteak tomatoes (which have been insanely good lately) and fell in love. 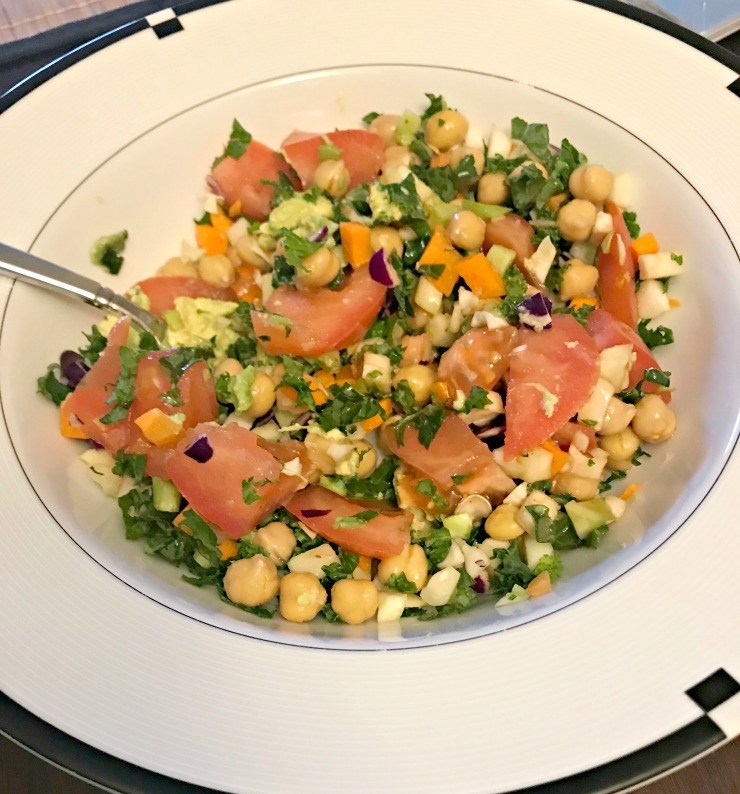 With no cooking required and a drizzle of Trader Joe’s balsamic vinaigrette, it’s like the perfect meal for me to make at home. If I have this salad for dinner, I’ve been adding Whole Foods 365 Organic Shoe String french fries on the side. I usually like the Whole Foods 365 Crinkle Cut fries but right now I am all about the Shoe String fries, especially with barbeque sauce! Granted I eat most of the fries while they are still in the oven cooking but still — delicious and perfectly crispy! Last but not least, I keep whole wheat bagels in the house to make pizza bagels. Yesterday afternoon, I had an emergency pizza bagel situation where I just needed half around 3:00 PM to make my stomach happy. Totally did the trick. Favorite meal to make at home right now? What are the emergency foods that make you happy and satisfied happy right away? Anyone else out there who hates to go food shopping even though they used to enjoy it? That salad looks so delicious, especially paired with fries! With building back up my mileage I’ve noticed I need a 3pm snack again and I’ve been reaching for salty things like crackers and cheese or nuts. 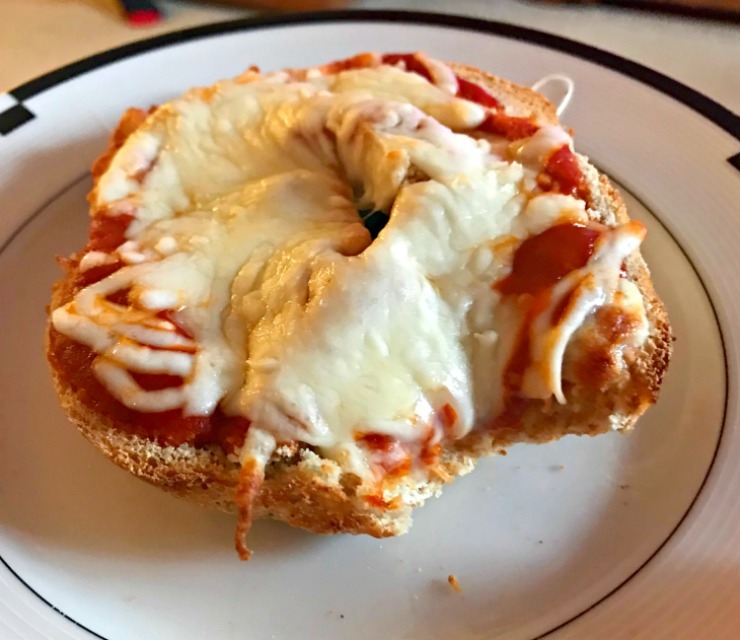 The pizza bagel looks so good also! Pizza bagel for the win. I adore the Trader Joe’s sweet potato fries. They are everything.